It seems like there are few things that I remember these days, but there are a few things that I will never forget. I am the oldest sister. This is a role I have always cherished. I have always loved having little sisters and brothers that I could look after and take care of. I have been blessed with three amazing and talented sisters. 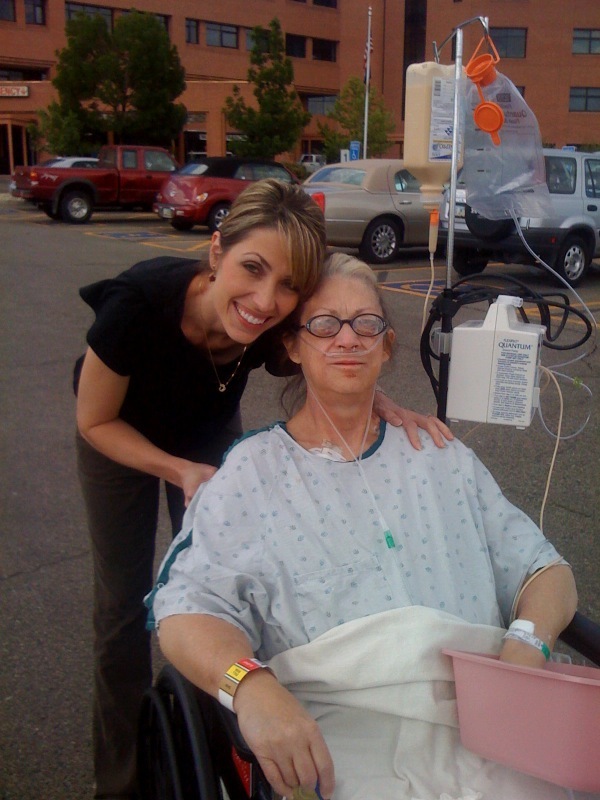 This picture is “The Last” picture that I took with my mom outside of her hospital, where she was dying of cancer. I remember taking her out for a walk that afternoon after just being told by her doctors there was no hope for her. Her body was failing her and she did not have much time. She did not have a lot to say but my mind was racing. I could not believe this was happening. Something told me that this would be “The Last” walk we would have together. A few days later I went home to see my kids and get a few things before my return to the hospital, and my mom called to have me talk to her doctors. I hung up the phone and I had a distinct feeling that would be “The Last” time I would talk to my mom on the phone. That was something we did at least three times a day. The next few days consisted of “The Last” hugs and kisses. “The Last” hands held. “The Last” goodbyes from my children to their Grammy. “The Last” song sung to a Mother from her kids. “The Last” Goodbye from a mother to her children and “The Last” breath of life. Since losing my mom I have started a new life’s Journey. It has not been an easy one at times, but it has changed my life forever. I look at the world and the people around me differently. I try not to take life for granted. I laugh more and eat more chocolate, for my mom of course! I look at this picture of me and my mom and I don’t see someone who is sick as most people would. I see the most beautiful woman and mother. I see a strong spirit shining through a body that just wouldn’t allow her to do what she wanted. I look at all the women around me and see such beauty and love. We all have beauty within. It does not matter our size, color of our hair, how much money we have, the list goes on. I always tell my kids I want them to be successful. They could have all the money and degrees the world can offer, but if they are not a kind, loving, and giving person, it would mean nothing to me. I know there is more that we can do for each other. There is more we can give, and more beauty we should seek to find on the inside. Women need more love and acceptance. It is my hope through this blog, that we can share all good things in life. That we can be more positive, optimistic, laugh at ourselves, and live each day like it truly is “The Last”!! I love you all. Smile more today. Neat post Krista, thanks! I have tears clouding my eyes at the moment, and I will remember to smile more today! So many emotions coursed through my body while reading this. I too eat chocolate in your mothers memory! I think of her when I have a bad hair day and smile. I look at you and see your mother…strong and beautiful! Thanks for this Krista. It must have been hard for you to write. I will definitely try harder to live in the moment and enjoy the time I have with my loved ones. Thanks for sharing!! Wow !!! It is so hard to type as I wipe all the tears from my eyes. I miss ur Mom so very much. I am so thankful for temple marriage. I just visited Moms grave yesterday. I can’t believe she is gone. I love and miss her so much. Krista , I know Mom is so proud of the woman you have become. I to I’m proud of you. That was so nice of you to write about Mom…love Dad. I love this blog! It is so refreshing to see what you are promoting, what you value, and what you deem important in life. This is the stuff that really matters in life and will bring us true happiness & joy. I can feel good about taking time to visit this blog everyday.